Microsoft on Tuesday released Office for Mac 2011 Service Pack 1, bringing security and maintenance updates to the suite of applications, as well as support for Apple Sync services with Outlook. Service Pack 1 is now available for download for owners of Office for Mac 2011. It is a 246MB file available direct from Microsoft, and requires that users be running Mac OS X 10.5.8 or later. Improved security. This update fixes vulnerabilities in Office 2011 that an attacker can use to overwrite the contents of your computer's memory with malicious code. Stability is improved. This update fixes an issue that causes Office 2011 applications to close unexpectedly when you open or use Office 2011 applications. Alt Text authoring is included. This update enables the authoring of Alt Text for objects, such as shapes, pictures, tables, charts, SmartArt, and movies in Office 2011 applications. The Solver add-in is included. This update includes functionality that lets you install the Solver analysis tools in Excel 2011. Password protect functionality is included. This update includes functionality that lets you protect presentations in PowerPoint 2011 by using a password. Synchronization functionality is updated. This update increases support for Sync Services, and adds calendar, notes, and tasks syncing. Rules functionality is improved. This update introduces support for Microsoft Exchange-based Server-Side rules. Resend functionality is included. This update reintroduces functionality to resend an email message to the same or new recipients. Redirect functionality is included. This update reintroduces functionality to redirect an incoming email message to other recipients. Meeting invitation functionality is improved. This update improves creating meeting invitations by including a list of recently used locations. Last week, Microsoft detailed new features of Service Pack 1, particularly the ability to sync calendar, tasks and notes via Apple's Sync services. Now, users can sync their Outlook calendar and other data with their iPhone or iPad. However, Apple plans to discontinue the use of Mac OS X Sync Services with its subscription MobileMe service on May 5 for all users. The change is already in place for users who moved their account to the new version of MobileMe calendar, which came out of beta last October. For Outlook for Mac 2011 users who sync their iOS device with Sync Services via iTunes, calendars will remain up to date. 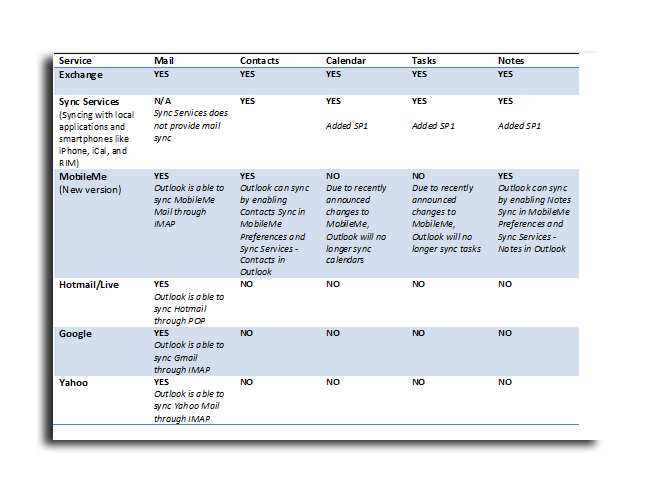 But users who sync their iPhone or iPad calendars with MobileMe will not have them synced to Outlook 2011 with SP1. Released last October, Office for Mac 2011 delivers better compatibility with Microsoft's Windows version of Office and corporate server products. It also features a new user interface that's similar to the Ribbon interface found in the Windows version of Office.